Women's Under Armour fitness, workout, and yoga clothing for sale online in a variety of styles including tank tops, shorts, and leggings. Under Armour Womens Fitness Crop Compression Leggings 1305430: These Under Armour leggings were designed to give you ultra support during any desired activity - featuring a wide waistband, a front logo, contrast side panels, and a crop ankle-length. Under Armour Girls Solid Colored Split Camisole Racerback Sports Bra 1305726: This versatile bra top can be worn to rehearsals and straight to the gym afterwards! Bra features dual camisole straps, a racerback, a back keyhole, and an Under Armour logo print band. Under Armour Womens X-Back Sports Bra Top 1276503: Training never looked so good! This compression workout bra top features a thick elastic band with the Armour logo, medium-impact support, criss cross back straps with keyhole, and HeatGear fabric that's lightweight and feels super smooth on the body.Best for A to C cups. Under Armour Womens HeatGear Armour Ankle Length Fitness Leggings 1309628: Versatile pieces, like these Under Armour leggings, are just what your workout wardrobe has been begging for! Leggings features a wide, elastic waistband, a small front logo, an ankle length, flatlock seaming for a chafe-free design, and compression HeatGear fabric that is sweat-wicking, quick-drying, and offers anti-odor technology to prevent the growth of those pesky odor-causing microbes. Under Armour Womens Mock Neck Long Sleeve Workout Jacket 1314544: Warm up for class or an intense gym session, with this fitted Under Armour jacket - featuring a mock neck, a full front zipper, long sleeves with thumbholes, front zip pockets, front mesh inserts, and a mesh back panel for added breathability. Jacket also features silky-soft, quick-drying, stretchy fabric. Under Armour Girls Sprint Drawstring Athletic Shorts 1305697: You'll sprint to the finish line with ease in these comfortable Under Armour shorts! Shorts feature an elastic waistband with a built-in drawstring, mesh leg inserts, a small front logo, and contrast-colored side piping. Under Armour Girls Fitness HeatGear Armour Capri Length Leggings 1305645: Add some fun to your workout wardrobe, with these printed Under Armour leggings - featuring an elastic waistband with logo print detail, an allover graphic print, a cropped length, and lightweight HeatGear fabric that is sweat-wicking, quick-drying, and designed with anti-odor technology and 4-way stretch. Under Armour Womens Contrast Ankle-Length Fitness Leggings 1305429: Amp up your traditional workout leggings with a pair of these printed Under Armour bottoms. Leggings feature a soft, elastic waistband, contrast leg inserts, a cropped length, and super light HeatGear fabric that is sweat-wicking, quick-drying, and has built-in anti-odor technology. Under Armour Womens ColdGear Armour Workout Compression Leggings 1298230: Avoid muscle injury by keeping yourself warm with these cold-fighting leggings - featuring a flat, stretchy waistband, flatlock seaming for a chafe-free design, and dual-layered fabric that is quick-drying, sweat-wicking, and designed with anti-odor technology and 4-way stretch. Under Armour Girls Graphic Print Logo Waistband Workout Leggings 1305647: Be one in a million with these striking Under Armour leggings - featuring an elastic waistband with logo print detail, allover eye-catching graphic print, a full length, and sweat-wicking, HeatGear fabric that dries quickly, delivers superior coverage without the weight, and is designed with anti-odor technology and 4-way stretch. Under Armour Womens Fleece Athletic Pants 1300267: Comfortable workout pants feature a thick ribbed waistband, a relaxed feel for added comfort, and a fleece blend fabric. Under Armour Womens Active Coolswitch Run Camisole Top 1313995: Designed with high-tech construction, the Under Armour Coolswitch-inch top will keep you cool while you beat your best. Top features camisole straps, mesh side inserts for added breathability, low armholes for added mobility, a cropped length, and anti-odor, sweat-wicking fabric. Top also features a Coolswitch-inch inner coating that pulls heat away from your skin, to help keep you feeling cooler. 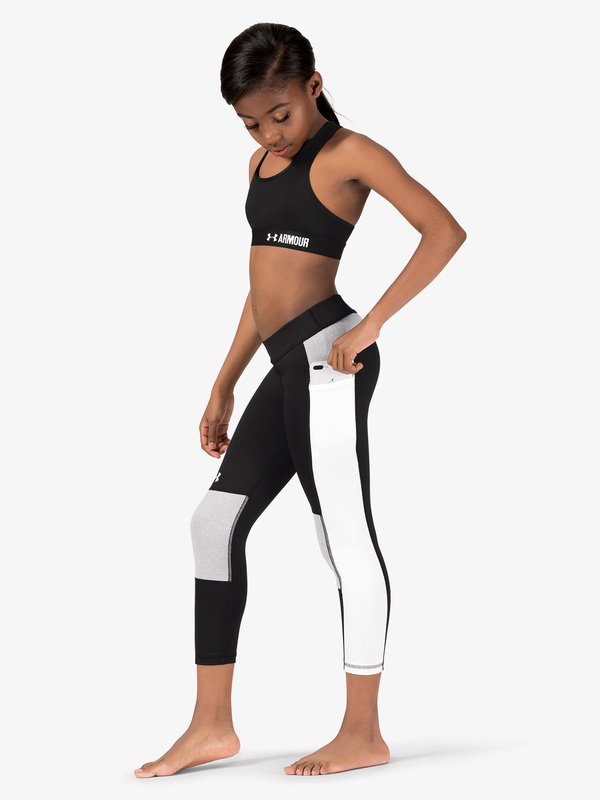 Under Armour Girls Colorblock Crop Fitness Leggings 1301761: Fashion-forward and gym-ready, these workout leggings feature an elastic waistband, a three-tone colorblock design, an Under Armour side leg print, and an ankle-length. Under Armour Womens Strappy Back Workout Bra Top 1289445: Fitness bra crop top features a halter strap, low scoop front, crisscross back straps, and an Under Armour logo stretchy band. Under Armour Womens Vanish Strappy Back Sports Bra 1307215: Get all the support you need without sacrificing any of the comfort, with the Vanish-inch bra by Under Armour. Bra features split camisole straps, a fashion-forward, multi-strap back, a back Under Armour logo, and a next-to-skin-inch feel. Under Armour Girls HeatGear Graphic Print Running Shorts 1305643: Get ready for your best workout with these ultra lightweight running shorts by Under Armour! Shorts feature a logo printed, elastic waistband, an allover stunning graphic print, sweat-wicking, quick-drying, stretchy HeatGear fabric with anti-odor technology, and a 3-inch inseam. Under Armour Womens HG Armour Compression Athletic Shorts 1316681: Get those legs moving in shorts that can keep up with you! These Under Armour shorts feature an elastic waistband, a front logo, a middy length, and compression construction for added support. Under Armour Womens Fitted Fitness Leggings 1295296: Get your endurance up in these sporty workout leggings featuring a thick stretchy waistband, fitted next-to-skin-inch feel, and full length. Under Armour Girls Attached Bra Active Tank Top 1298832: Getting ready for the gym just got a whole lot easier! This two-in-one top features tank sleeves, a racerback with oversized logo print detail, a graphic print, built-in bra, and HeatGear fabric that is sweat-wicking, quick-drying, and designed with anti-odor technology and 4-way stretch. Under Armour Womens Marbella VI Flip Flops 3000072: Head to dance class in comfort! These sandals feature a synthetic strap with soft foam lining, dual-layered footbed made of performance 4D foam, and sculpted EVA outsole providing lightweight comfort and traction. 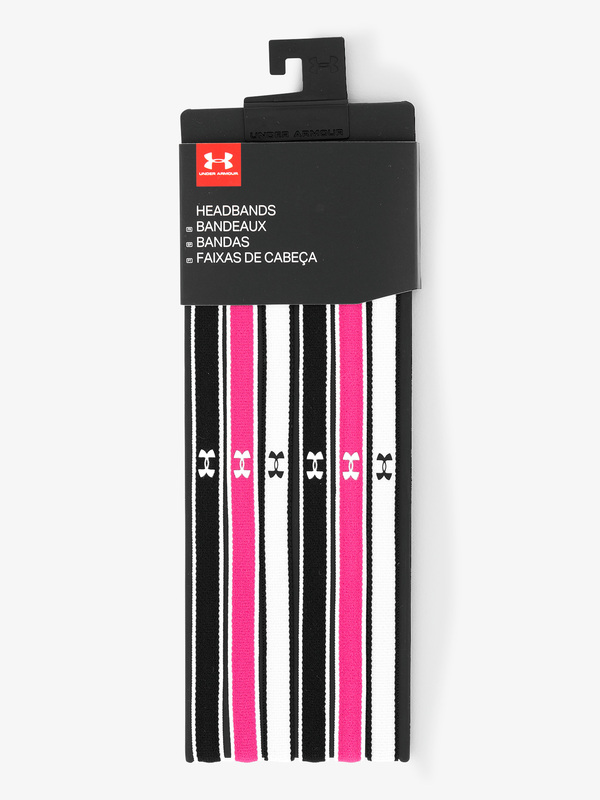 Under Armour Mini Active Headbands 1286016: Keep hair in place during your workouts with these stretchy fitness headbands featuring a soft finish, center UA logos, and silicone strips for secure grip.6 headbands included. 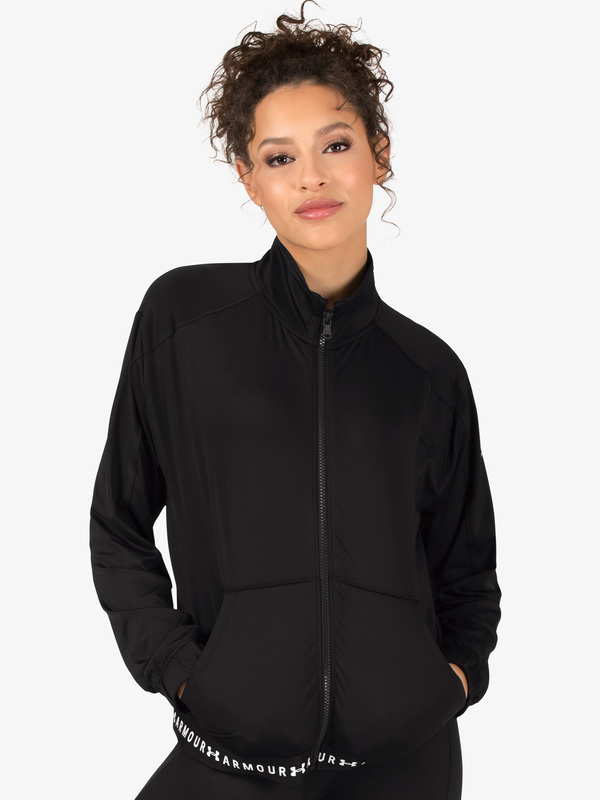 Under Armour Womens Fitted Athletic Jacket 1295298: Look chic in this sporty workout jacket featuring a high mock neck detailed with Under Armour logo, full functional vertical zipper, and long sleeves with thumb holes. 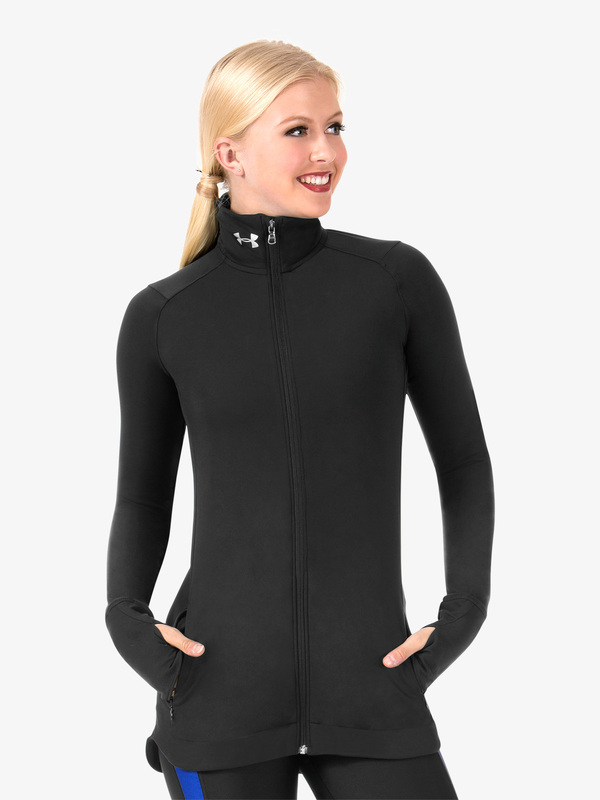 Under Armour Womens Logo Print Full Zip Workout Jacket 1320589: Look ultra cool while feeling ultra comfortable in this fashion-forward Under Armour jacket - featuring a mock neck, a full front zipper, cuffed long sleeves, front pockets, back mesh inserts for added breathability, and a trendy, logo print band. Under Armour Girls Workout Soft Knit Capri Leggings 1320084: Made with super soft knit, these leggings are so comfortable you'll never want to take them off! Leggings feature a stretchy waistband, stripe detail at the hem, a cropped length, and sweat-wicking, quick-drying, super stretchy fabric. Under Armour Womens Active Tech Graphic Print Tank Top 1305417: Make a statement in this tech tank top - featuring tank straps, an oversized front logo, a traditional racerback, and sweat-wicking fabric. 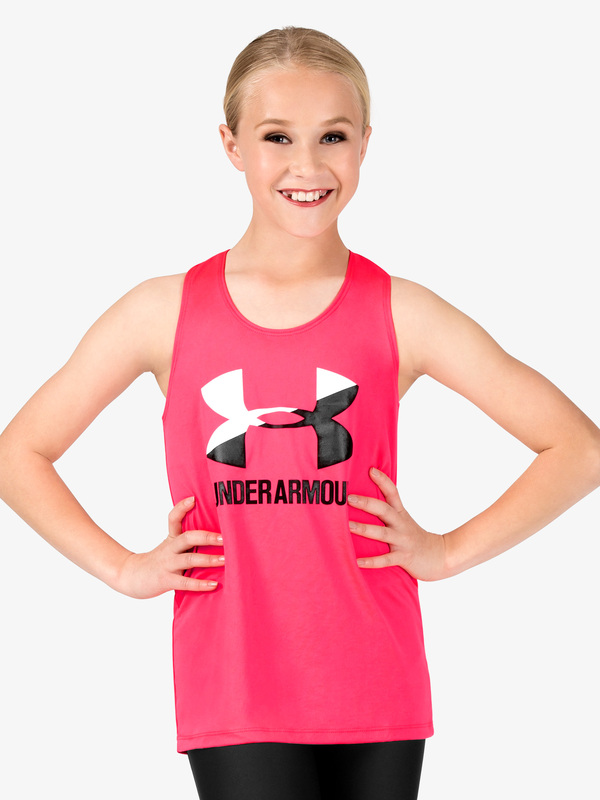 Under Armour Girls Big Logo Print Active Tank Top 1301883: Merging a classic silhouette with a bold logo, this tank will take you from dance practice to the gym, all while keeping the attention on you. Top features tank straps, an oversized front logo with split colors, a classic racerback, and soft, lightweight fabric that wicks away sweat, offers anti-odor technology, and dries quickly. Under Armour Girls Active Bold and Bright Graphic Print Short Sleeve Tee 1305327: Ooze in confidence with this graphic tee by Under Armour - featuring short sleeves, a Bold and Bright-inch colorful text logo, a slightly cropped hem, and Charged Cotton fabric that dries quickly, wicks sweat away, and has comfortable 4-way stretch. Under Armour Womens HeatGear Armour Running Shorts 1309618: Perfect for those sunny workouts or outdoor dance practices! These shorts feature a logo printed, elastic waistband, a small front logo, flatlock seaming for a chafe-free design, and HeatGear fabric that is extremely lightweight, is quick-drying, sweat-wicking, and offers anti-odor technology. Inseam: 3 inches. Under Armour Womens Cropped Fitted Fitness Leggings 1297907: Push yourself in these workout leggings featuring a thick waistband, cropped cut, second skin-inch feel, lightweight feel, quick-dry and anti-microbial fabric. 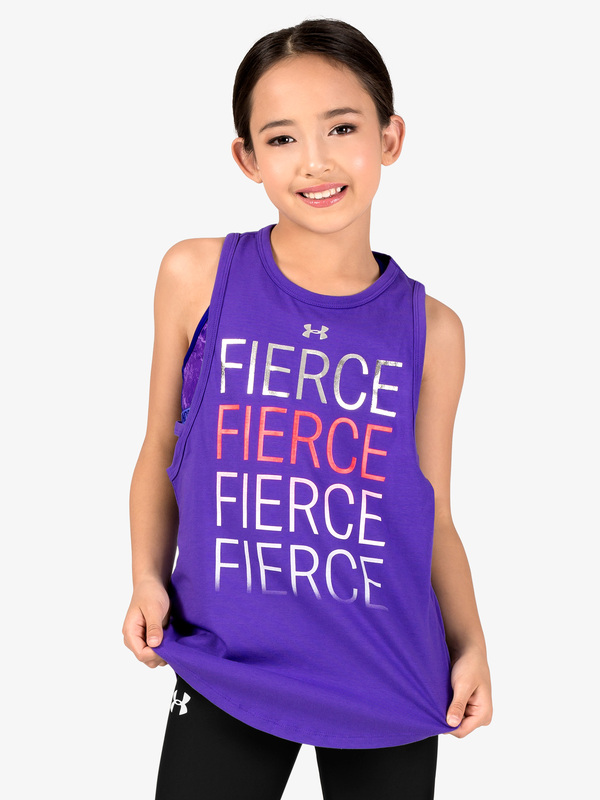 Under Armour Girls Active Fiercest Graphic Print Tank Top 1320161: Show your workout just how fierce you can be. 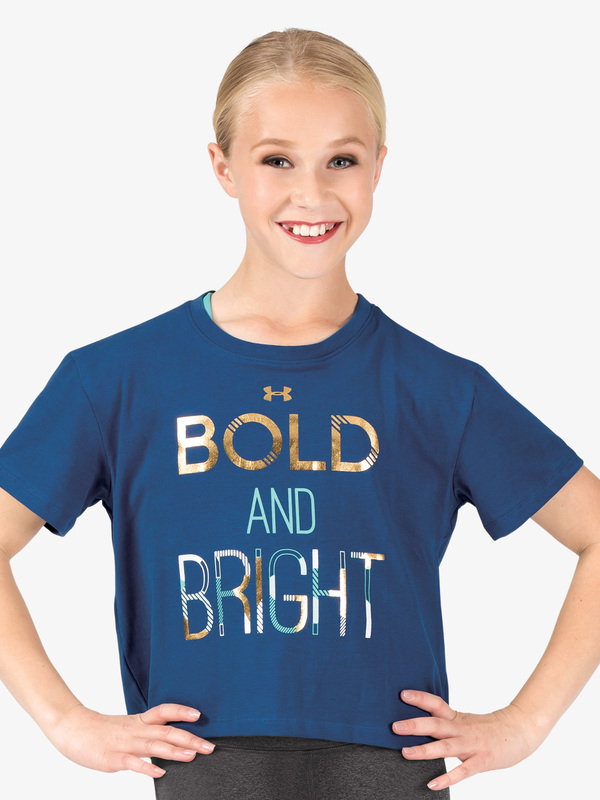 This bold top by Under Armour features tank straps, an ombre-detailed Fierce-inch graphic print, a low racerback with strap detail, and a dolphin hem. Under Armour Womens Active ColdGear Armour Long Sleeve Top 1298262: Stay warm and look chic in this ColdGear top by Under Armour - featuring a mock neck, a logo print on the neckline, long sleeves with thumbholes, a curved hem for a flattering silhouette, and ultra-warm fabric that is quick-drying, anti-odor, sweat-wicking, and has 4-way stretch that moves better in every direction. Under Armour Womens Hooded Workout Sweater 1300261: Stay warm during those early dance mornings in this Under Armour long sleeve athletic sweater featuring a hood with drawstrings, a relaxed design for comfort, and fleece lining for ultimate warmth. 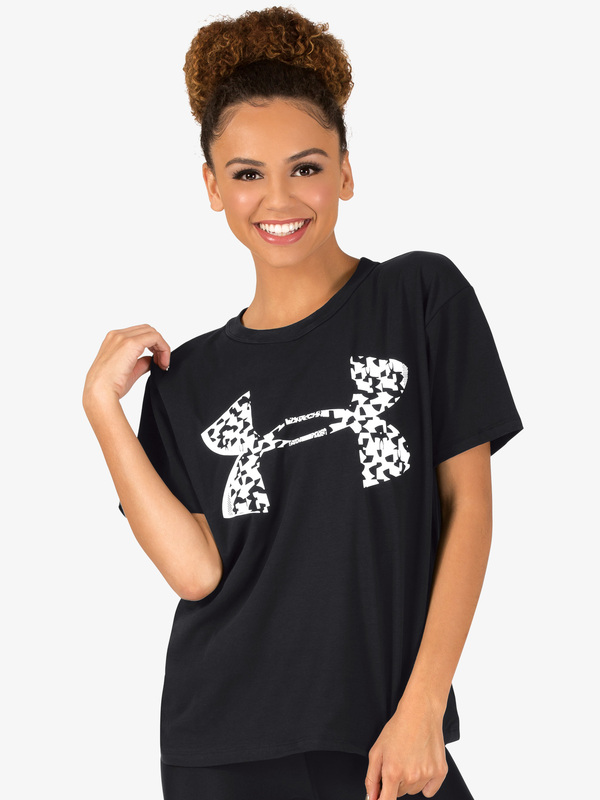 Under Armour Womens Girlfriend Crew Neck Active Short Sleeve Tee 1320617: Take this tee from the studio, to hanging out with friends, and to the gym! Top features short sleeves, a crew neck, a front logo with speckled detail, and a generally relaxed silhouette for the utmost comfort. Under Armour Womens HeatGear Racerback Active Tank Top 1271765: Thanks to this Under Armour HeatGear tank, you can finally amp up the intensity while staying cool and comfortable. Top features tank straps, breathable pinhole mesh, a racerback, and flatlock seaming for a comfortable, chafe-free design. Fabric is also sweat-wicking, anti-odor, and has 4-way stretch. 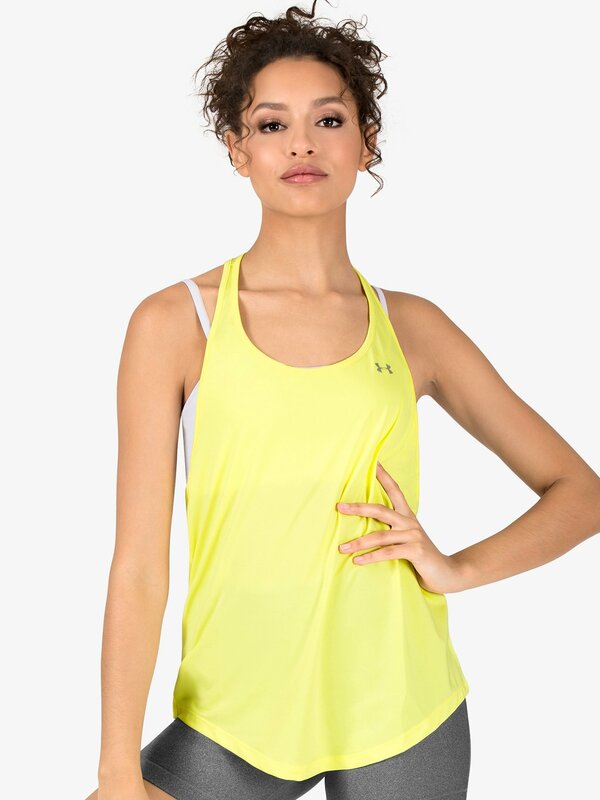 Under Armour Womens Active Mesh Back Tank Top 1316124: The classic style of this Under Armour tank, allows you to easily mix-and-match it with any of your favorite active pieces. Top features tank straps, a small, Under Armour front logo, a mesh racerback, and a curved hem. 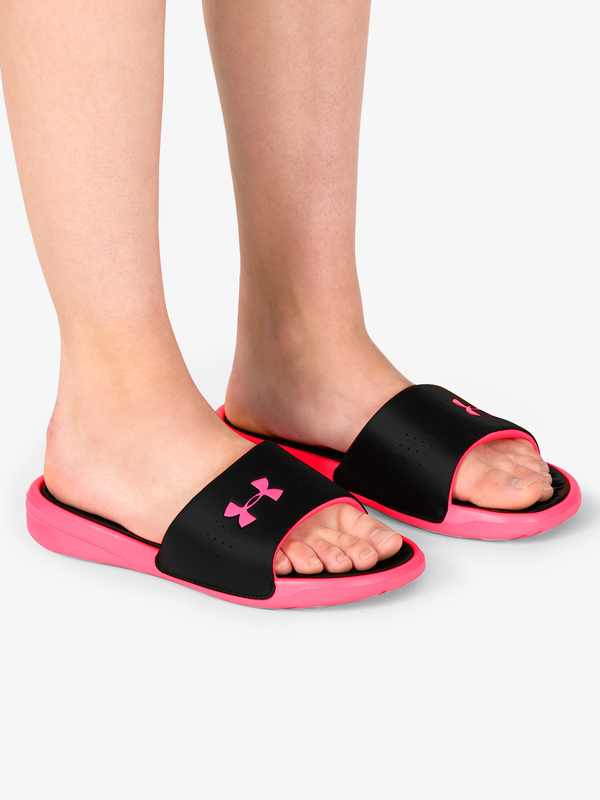 Under Armour Womens Playmaker Fix Slides 3000063: The lightweight Playmaker Fix-inch slides by Under Armour feature synthetic uppers with perforations, plush fabric linings, a textured footbed that massages the foot, and a durable man-made outsole. 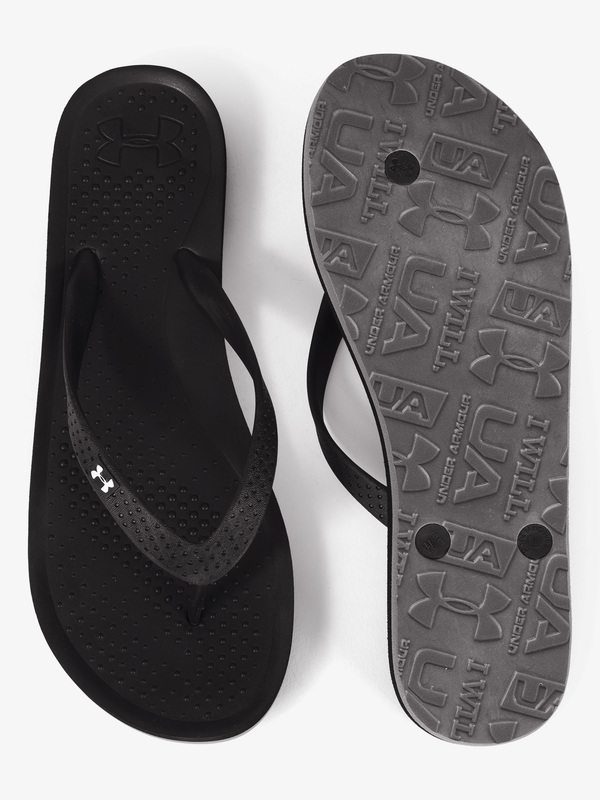 Under Armour Womens Atlantic Dune Sandals 1252540: The perfect shoe to wear to dance rehearsals, the beach, and beyond! Flip flops feature quick-drying TPU straps, and ultra cushion for the greatest comfort. Under Armour Womens HG Armour Compression Workout Leggings 1309631: The perfect staple to add to your workout wardrobe - these leggings feature a stretchy waistband, a front logo, flattering seaming, and a compression second skin-inch feel. Under Armour Womens Play Up 2.0 Logo Waistband Athletic Shorts 1292231: The Play Up 2.0-inch shorts are so flattering and comfortable, buying a back-up pair is not out of the question! Shorts feature a logo printed, elastic waistband, front pockets, a front logo, and soft, lightweight knit construction. Shorts also feature fabric that is sweat-wicking, quick-drying, and offers anti-odor technology to prevent the growth of odor-causing microbes. Under Armour Womens Vanish V-Front Tank Sports Bra Top 1311811: The Vanish-inch sports bra will do just what the name suggests, and fit seamlessly under your favorite workout tops. Bra features tank straps, a v-front, bra cup pads for extra support, adjustable crisscross back straps, and a back keyhole. Bra also features silky-soft fabric designed with Microthread technology so it dries faster, avoids chafing, and stretches without absorbing sweat. Suggested for medium-impact activities. Under Armour Womens HeatGear Workout Leggings 1297910: These compression fitness leggings feature super lightweight, sweat-resistant, stretchy yet maintain their shape, and a comfortable wide waistband. Under Armour Girls Workout Logo Print Waistband Capri Leggings 1305644: These flattering, on-trend leggings feature an elastic waistband with logo print detail, a front Under Armour logo, and next-to-skin, anti-odor, sweat-wicking HeatGear fabric. Inseam: 16 inches. Under Armour Girls Logo Print Waistband Workout Leggings 1305646: These flattering, on-trend leggings feature an elastic waistband with logo print detail, a front Under Armour logo, and next-to-skin, anti-odor, sweat-wicking HeatGear fabric. Inseam: 25 inches. Under Armour Girls Logo Print Waistband Running Shorts 1305642: These flattering, on-trend shorts feature an elastic waistband with logo print detail, a front Under Armour logo, and next-to-skin, anti-odor, sweat-wicking HeatGear fabric. Inseam: 3 inches. 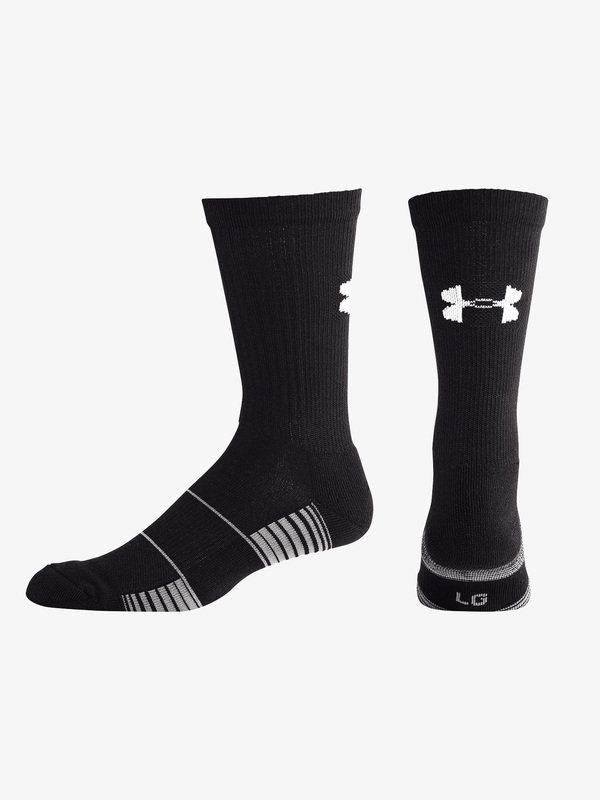 Many more styles at UNDERARMOUR STORE.